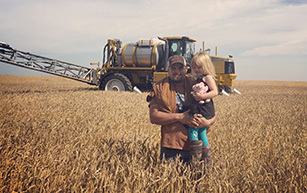 Travis and Becky Page, along with their kids, Joni, Grady, Morgan, and Orin, operate Redline Livestock near Didsbury Alberta. The ranch is located less than an hour's drive north east of Calgary International Airport, about 20 Miles East of Didsbury, AB on the #582 Highway. Largely based around livestock, the operation consists of about 400 breeding females. The seedstock portion being about half of the overall numbers, is divided between two breeds; Red Angus and Polled Herefords. The commercial herd is based around non registered polled Hereford cows, bred to purebred red angus bulls. The commercial calf crop each year is bred to be majority F1 crossed calves. Travis and Becky met at Olds College, where they each studied Agriculture Business and Agriculture Production. 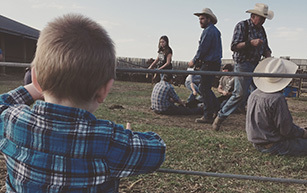 The cattle operation took form in 2008, and began with the purebred herd at the forefront. In 2013 the couple had an opportunity to take over the Willow Creek Farm herd of commercial Hereford females, and move them from Becky's parents' (Ed & Leona Johnston) ranch in Grenfell Saskatchewan, to Alberta. Continuing the management and records on a well established, closed herd of high quality commercial females gave Travis and Becky the opportunity to expand Redline to become their mainstay, and also enable them to adjust their primary focus from acquiring cattle to improving quality. Time being the biggest limiting factor, the Pages try to have cattle on display each fall at various cattle shows, including Olds Fall Classic, and Farmfair International. Each spring, the sale bulls can be viewed out of the yard, as well as at events like the Crossroads Beef Expo (Oyen, AB) and Canadian Bull Congress (Camrose, Ab). The entire crop of purebred bulls is offered for sale by Private Treaty, as well as large annual packages of commercial F1 Baldy Bred Heifers. When the cattle are out to pasture for the year, Travis enjoys working alongside his family farm's grain operation during the growing season, and puts up feed for the cowherd. Becky and her Mom are also co-owners of Willowline Labradors raises purebred Labrador Retriever dogs. 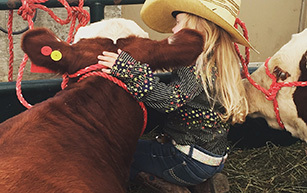 From here onwards, their plan is to continue to seek elite genetics to incorporate into the cowherd, and to get the kids involved in the industry in any way they can, including junior shows, 4H, and helping at home. Travis is a board member on the Canadian Red Angus Promotion Society, and the couple hopes that they can both take on new and progressive roles in the Canadian Beef Industry that can continue taking the breeds and their own herd forward. 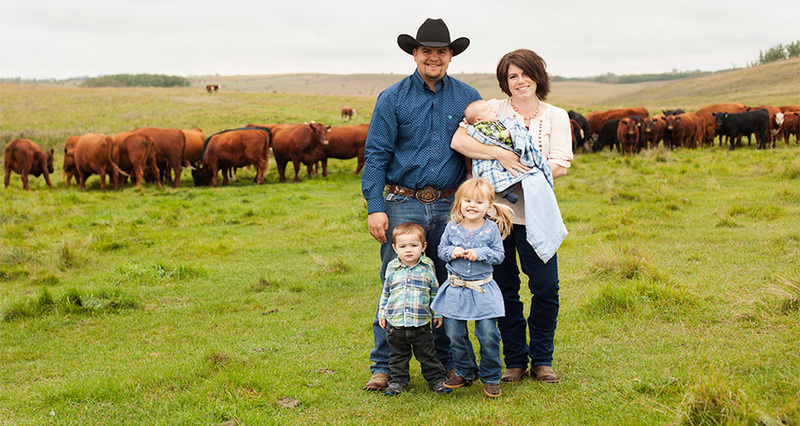 Travis and Becky have been involved in beef cattle their entire life, and they hope to continue their involvement through to retirement, and well beyond, keeping it a family tradition, alongside their kids. Thank-you for supporting our program. Whether you have called about bulls, taken a herd tour, or purchased genetics through private treaty or fall female sales, we appreciate every bit. It is support from friends and neighbors, cattlemen and producers, that keep the wheels turning. We will never stop improving our herd and our operation.